A city of lights, sights, and tons of really, really, REALLY good food. I traveled to Paris on my solo journey this fall and was able to connect with my local Parisian friend, Estelle Lubino. Estelle holds a key to this very special city - she’s a local. Estelle and I met through IG years ago. We were drawn to each other because we both shared an affinity for smoothie bowls, plants, and design. We spent a few days together exploring, and below are my favorite picks from our time together. Enjoy this list of stores to visit, smoothies to savor, espresso to sip and croissants to munch on while you travel the city by foot, my favorite way of getting around. THE place for smoothies, juices, and one of the few places that serves non-dairy yogurt in Paris. I got their peanut butter banana bowl with extra almond butter on top and it was *EVERYTHING*! Creamy, sweet, and blended to perfection. It tasted like a DQ Blizzard. Definitely not an everyday breakfast for me, it’s more of a treat since I am sensitive to bananas. We got extra almond butter on top, of course. It was heavenly. Fret not if your google maps isn’t working, you can smell this place from blocks away. It’s the freshest, most delicious bakery in Paris! Not gluten free, definitely not refined sugar free, but it’s the real-freakin’-deal! I got the l'escargot chocolat pistache pastry, a snail-like pastry with pistachio cream and chocolate chips. I’d go as far to say it was a life changing experience. I also tried their normal croissant, which compared to the chocolate pistachio pastry was just okay. Go big, or go home. When Estelle walked me into this store, she kind of looked at me and went, “you’re gonna hate me for taking you here!” and she was right. I had no idea what I was in store for, this store was INSANE. It’s multi leveled and filled with stuff- yet insanely organized and aesthetically pleasing. 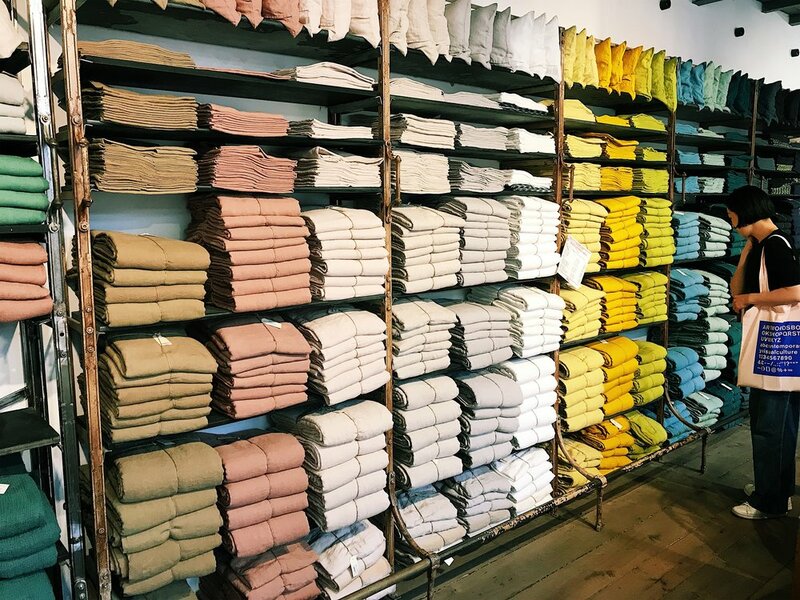 It’s a massive concept store filled with craft goods, pop up vintage, eclectic straw bags, bedroom linens, ceramic mugs, fuzzy sweaters, slippers, wallets, sunglasses, little spoons, you name it. If you love specialty items, you’ll love this store. A perfect place to grab a souvenir or a gift for a friend. The kitchen section was my favorite. Did you even go to Paris if you didn’t eat a macaroon? I purchased macaroons here to fly home with as gifts, and they held up very well. They sell hard boxes of them, perfect for traveling and long flights. When I gifted my macaroons, of course I got to taste them - and they lived up to the hype. The macaroons look as pretty as they taste. I recommend the passionfruit, vanilla, and pistachio flavors for a pop of color. Perfect for a healthy-ish dinner in the Le Marais neighborhood of Paris. It’s a Japanese-fusion spot with French inspiration. Think fresh ingredients, pungent marinades, gluten free items, tons of veggies, and high quality meats if that’s your thing! They are known for their bento boxes, but I opted for the Don de boeuf, which was a plate of rice, wilted spinach, and perfectly cooked steak in a really nice Tamari sauce. It was filling, nourishing, and tasty without weighing me down. I recommend it! This place reminded me of Moon Juice here in Los Angeles with its excellent decor, plants everywhere, and a menu boasting everything from date-sweetened raw granola to spirulina popcorn to kale chips. I never got any of their cold-food items, but their matcha latte was delicious, and their daily soups looked good (though they were always sold out when I tried to get some!) It’s a good place to stop in for a healthy snack while rendezvousing around, since they have tons of locations around Paris. If you want good coffee and conversation in Paris, THIS is your spot. While I’m not an every day coffee drinker in the US, when I’m in Europe, it’s a different story. It’s half to fight the jet lag and half to get into the culture and “live a little”. The coffee at La Caféothèque was incredible. I had met up with another solo traveler and we shared 3 espressos with a fellow American we met outside. It was just glorious and we shared such a special conversation. I will return here if I ever go back to Paris. JahJah is a fun, veg-forward casual eatery with a vibrant menu and energetic atmosphere. I ate here at lunch and it was jam packed. They have communal tables so expect to sit close and cozy up! Their menu rotates almost daily if I’m not mistaken, so you can be sure you’re getting fresh, innovative foods. You can choose between a “warm” bowl and a “cold” bowl which is cool if you’re into Ayurveda like me. Basically, one bowl is cooked and one is more on the raw side. Estelle and I took a spin class at Dynamo one morning. It’s Soul Cycle’s spinning image! Similar branding, dark rooms, loud music, and enthusiastic instructors. I took the whole class in French, which was hilarious since I had no idea what they were saying but just followed the cues of all the other students in the class. If you want to sweat it out, head here. I recommend strolling around the neighborhood of Le Marais for a few days if you are in town. There are tons of cafes, neighborhood parks, and beautiful streets to walk up and down. My favorite memories from Paris reside in this area. It’s also where my Airbnb was. Here is the listing for my Airbnb. Have you been to Paris? If so, tell us below where you like to eat, stay, drink coffee and find healthy things!